Skooma is a narcotic made from refined moon sugar. Unlike in previous games, skooma has no negative effects, and drinking skooma will restore stamina for 25 points. It is technically illegal, but unlike in other provinces Skyrim merchants will not refuse to do business with you if you possess any, and will even trade skooma directly with you. Some NPCs (e.g. 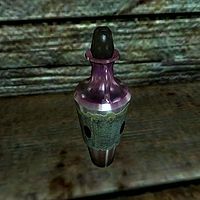 bandits) make comments that the skooma in Skyrim is "watered down" and not as strong as in other parts of Tamriel; this may be why it is less valuable than in previous games, and in fact worth less than the raw moon sugar used to make it. Skooma can be purchased from Khajiit caravans. Prisoners in Cidhna Mine, a silver mine operated by prisoners in Markarth, smuggle skooma into the mine and use it as a currency. There is a skooma den in Riften. As part of the quest The Raid you can find eight bottles of skooma here. Nine bottles of skooma can be found in Cragslane Cavern. There are four bottles of skooma within a small bandit camp west of Whiterun. There are a few skooma bottles on top of a crate outside the entrance to Ustengrav next to a dead bandit, implying that he overdosed on the substance. While roaming the wilderness, a skooma dealer may offer you the chance to purchase some skooma. If you intimidate them unsuccessfully or tell them that it is illegal they will attack you. Alternatively, you can kill or pickpocket them to take their supplies. There are three bottles of skooma at the Shrine of Boethiah, on a box next to the tent and bedrolls. One full bottle of skooma and an empty one can be found in the East Empire Company Warehouse on the shelf near the entrance to Brinewater Grotto. Two bottles of skooma are found on a table in Lost Knife Hideout. Three bottles of skooma are found in the cabinet at Septimus Signus's Outpost. Two bottles of skooma can be found at Orphan's Tear, inside the shipwreck's cabin, lying on the floor beside the bed roll. One bottle of skooma can be found in The Stumbling Sabrecat, hidden under the counter. A bottle of double-distilled skooma is located at the New Gnisis Cornerclub. Three bottles are found in Thaumaturgist's Hut, in a bowl upstairs. Two bottles of skooma can be found in Beggar's Row in Riften. M'aiq the Liar carries three bottles of skooma, which can be pickpocketed from him.